Support and resistance form the foundation of most chart patterns. A support level is the price at which buyers are expected to enter the market in sufficient numbers to take control from sellers. The market has a memory. When price falls to a new Low and then rallies, buyers who missed out on the first trough will be inclined to buy if price returns to that level. Afraid of missing out for a second time, they may enter the market in sufficient numbers to take control from sellers. The result is a rally, reinforcing perceptions that price is unlikely to fall further and creating a support level. 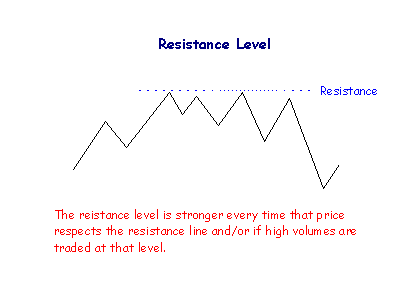 A resistance level is the price level at which sellers are expected to enter the market in sufficient numbers to take control from buyers. When price makes a new High and then retreats, sellers who missed the previous peak will be inclined to sell when price returns to that level. 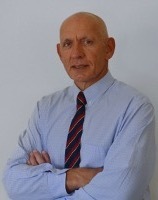 Afraid of missing out a second time, they may enter the market in numbers sufficient to overwhelm buyers. The resulting correction will reinforce market perceptions that price is unlikely to move higher and establish a resistance level. Point and figure charts are useful for identifying support and resistance levels. 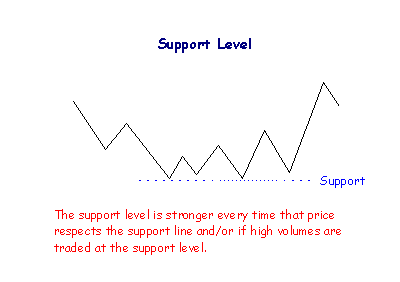 Support levels, once penetrated, frequently become resistance levels and vice versa. The market logic is fairly simple: buyers who purchase near a support level, only to see price fall, are likely to sell in order to recover their losses, when price rallies to near their break-even point. 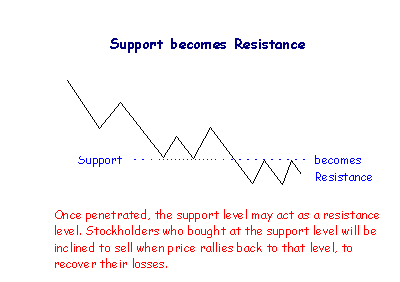 The support level then becomes a resistance level. Likewise, stockholders who sell when price approaches a resistance level will be disappointed if price penetrates the level and continues to rise. They will be inclined to buy if price returns to near the support level, fearing that they may miss out a second time. The resistance level thus becomes entrenched as a support level. a level formed at a round number (e.g. $20.00 or $100.00) leaves a lasting imprint.